Ever imagined how beautiful plants that gives us our food can be? I guess most of my visitors might have watched Dilwale Dulhania Le Jayenge, a blockbuster movie, which recently completed 1000 weeks since its initial release back in October, 1995. Now try going back the memory lanes and try recalling the yellow farms with mustard plants. I guess, I have successfully taken you to realize what am I talking about. Now just imagine, how beautiful would you find it standing in between one such farms, full of bright yellow mustard blooms on top of upright standing plants. Most of those who have ever been to villages might have see the farms for real. Here in my rooftop garden, I endeavour to grow whatever is possible for me to do here, so that I could get a view of the beautiful blooms these plants bear. All for the love of blooms. 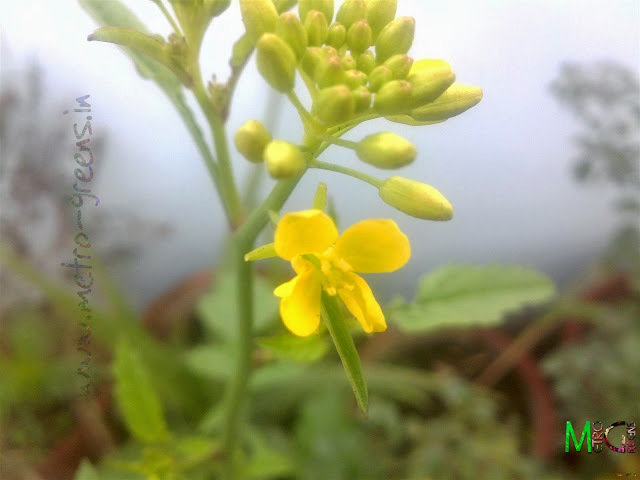 So, this time around, I went on sprinkling some mustard seeds, in a few pots, not intended to get a rich harvest of the oil seeds, just for the sake of seeing the beautiful blooms. Nothing much to get back. Here I am with a couple of shots from the one of the plants that survived. Take a look and enjoy! If you ever get a chance to visit a mustard farm, do try and enjoy the blooms, though from some distance. don't intend to use more than one senses (i.e. don't try to smell the beautiful looking blooms, you'll most probably regret later, if you do). A while back, okay, long ago, I clicked blooms of some of my fennel plants. One of those are featured in the header, up in on the site. Just take a look. It's beautiful, worth taking a look. 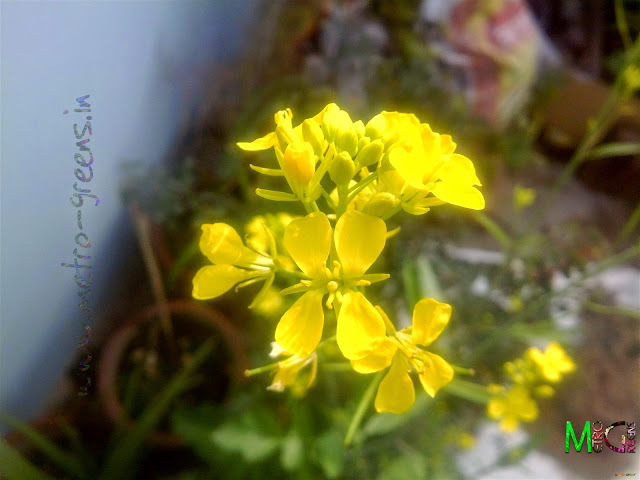 And everytime I see those yellow mustard blooms, I get reminded of DDLJ. Thanks for your visit.